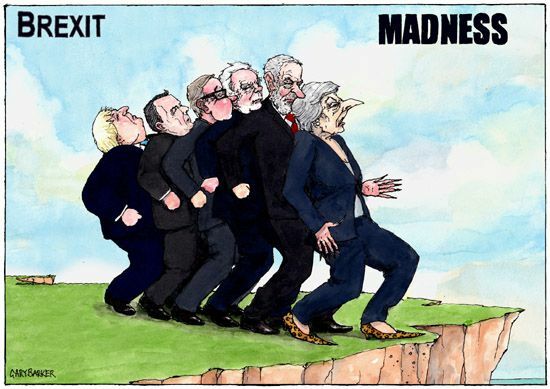 Brexit madness cartoon with Theresa May, Jeremy Corbyn, David Davis, Michael Gove and Boris Johnson about to take one step beyond leaving the EU. As the rhetoric ramps up and UK political leaders become more and more deadset on delivering brexit the remainers look on in incredulity at the madness developing around them with hope fading of a second referendum or a reversal of the first referendum result. Either way the UK looks deadset to remaining bitterly divided and possible no longer united as the only solutions to the Irish question appear to lead to the inevitability of Northern Ireland ceding form the union and becoming one wit the Irish republic.